You may think that marital bliss means money doesn't matter, but in today's troubled economic times, that's simply false hope. And with layoffs galore and debt mounting, financial stress is through the roof. Think keeping afloat and affectionate is impossible? Think again. This inspiring, action-oriented guide helps young women in committed relationships understand and manage their money matters. Complete with charts, graphs, case studies, and tip-based advice, this succinct, straightforward guide speaks to worried women in the same way that made On My Own Two Feet a mega-success. Move forward using the "three powers steps to financial success"
This expert author team is here to help once more. Clearing up confusion, stating the truth, developing a planand now, helping create a happy home. Manisha Thakor, MBA, CFA (Houston, TX and Santa Fe, NM) and Sharon Kedar, MA, CFA (San Francisco, CA) are best girlfriends and the coauthors of the hit book On My Own Two Feet: A Modern Girl's Guide to Personal Finance. Both Thakor and Kedar earned MBA degrees from Harvard Business School and are Chartered Financial Analyst (CFA) charterholders. As personal finance experts, their work has been featured in national media such as BusinessWeek, US News & World Report, Glamour, Woman's Day and NBC Nightly News. 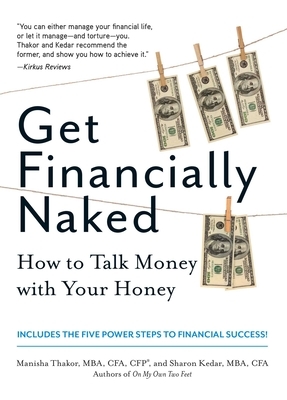 Thakor and Kedar are fully committed to getting financially naked with their husbands and effectively managing their household finances.